We've been building a large Xamarin.Forms application for quite some time at Hitcents, and there was a huge paint point I was able to figure out for our team. If you've ever gotten into Xamarin.Forms development, it becomes quite clear that there isn't a guide for unit testing things like markup extensions, custom views, navigation, animations, etc. The dilemma is, if you try set setup your own Xamarin.Forms.Forms.Init() for the purposes of unit testing, you quickly find that most of the interfaces needed to set this up are marked internal. To get around this issue I took advantage of [InternalsVisibleTo], and created a unit testing library where I renamed the output assembly to Xamarin.Forms.Core.UnitTests.dll. This allowed me to setup a MockForms.Init() method, and this assembly name isn't likely to conflict with anything in a developer's Xamarin.Forms project. So how do I set this up in my project? Conveniently, I've open sourced this little library named Xamarin.Forms.Mocks on Github, and I've even setup a package on NuGet for easy setup. 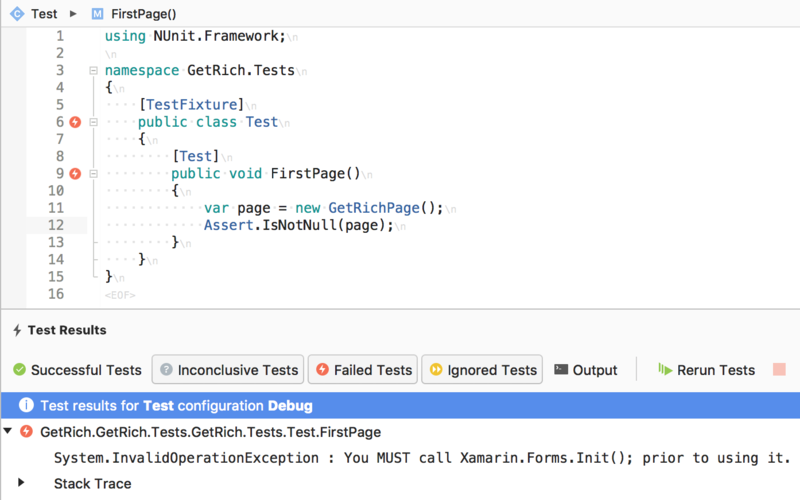 Hopefully, this is helpful to Xamarin.Forms developers out there wanting to use more TDD. There are still a few pieces of Xamarin.Forms internals not implemented yet. Let me know if there is something missing you need and get involved.